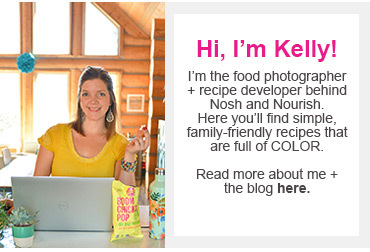 Hi everyone, I’m so excited to be joining you on Nosh & Nourish today! 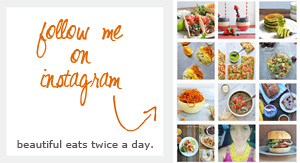 I’ve been a long time fan of Kelly’s site, her healthy and delicious recipes, and her stunning food photography. Who else’s mouth is watering every time a new recipe is sent to our inbox!? Before we dive into our recipe today, let me take a second to introduce myself. I’m Alyssa, a self-proclaimed gluten-free foodie who has a serious obsession with quinoa. On my own gluten-free food blog, I share creative, wholesome recipes all with a little quinoa twist, and I’d love for you to come see what it’s all about! I’ve been living gluten-free for almost four years now and have to say it has completely changed my life. All throughout my teens and early twenties, I struggled with chronic stomach pain. I was young, didn’t take very good care of myself, never paid attention to what I ate, and figured stomach pain was just a normal symptom of eating. It wasn’t until after college that I realized the discomfort I was living with really wasn’t normal. Most people don’t immediately feel disgusting after every single meal that they eat. I vowed to make a change in my diet and see if that helped me. I removed gluten and dairy from my diet, and I truthfully have not looked back. I feel one hundred times better - lighter, happier, more energetic, and more beautiful in my own skin. So why quinoa you may be wondering? Quinoa was one of the first “gluten-free” ingredients I started playing with, and from the moment I first tried it I was hooked. I loved the fluffy texture, nutty flavor and the fact that it was loaded with nutrients. I started cooking with it on a regular basis and so my food blog was born. Quinoa is a superfood in every sense of the word. Not only is this little seed naturally gluten-free, but it’s packed with healthy nutrients that help it stand out above other similar grains (like brown rice). Quinoa has all nine essential amino acids, making it a complete vegetable protein. It’s also a complex carbohydrate meaning it digests more slowly in your system, which helps to keep you fuller longer. But what I love most about quinoa is its versatility. You can make things like the quinoa chocolate chip cookies that Kelly recently shared on my blog, or you can make a simple, savory salad like we have here today. This salad is seriously tasty. 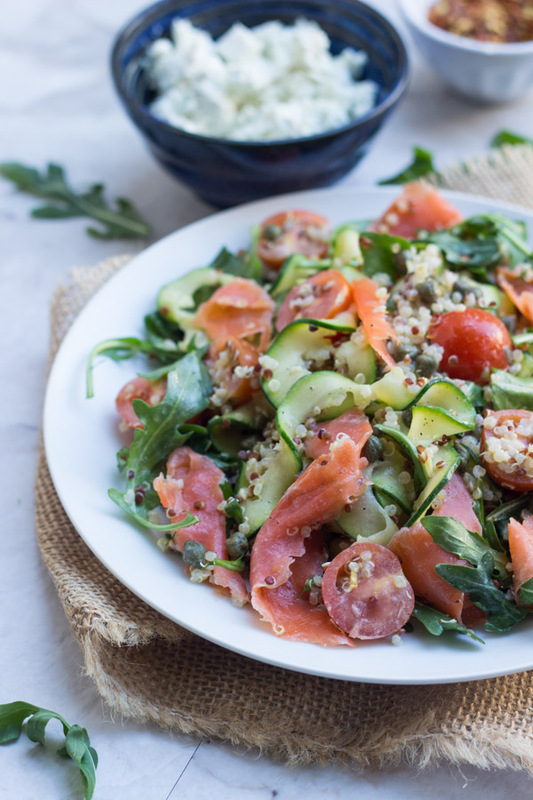 If you’re a fan of lox and bagels, I think you’ll love this salad. Actually even if you’re not a fan of lox and bagels, I think you’ll love it. 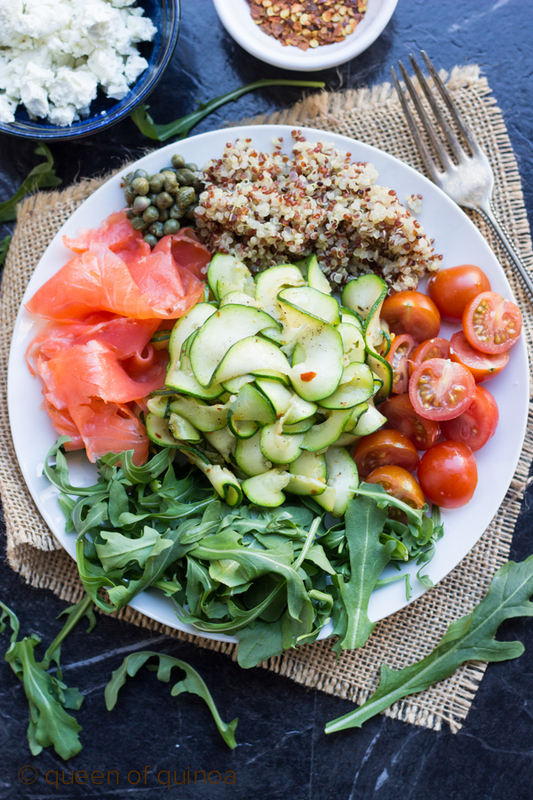 We’re using warm zucchini noodles, made with a spiralizer, then served with protein-packed quinoa, smoked salmon, capers, vine-ripened cherry tomatoes, spicy arugula and a creamy cashew dressing. I know it sounds like a lot of flavors mixing, but when all tossed together this salad turns into something marvelous. Right, filling and oh-so satisfying. Heat oil in a nonstick skillet over medium-high heat. Once warm, add zucchini pasta and saute until soft, 2 - 3 minutes. Season with salt and pepper as you go. While zucchini is cooking, prepare the dressing. First rinse the cashews then add nuts and remaining ingredients to a high powered blender. Blend on high until smooth and slightly thick. Add additional cooked quinoa as necessary. When zucchini noodles are warm and slightly softened, split and transfer them to two large plates / dishes. 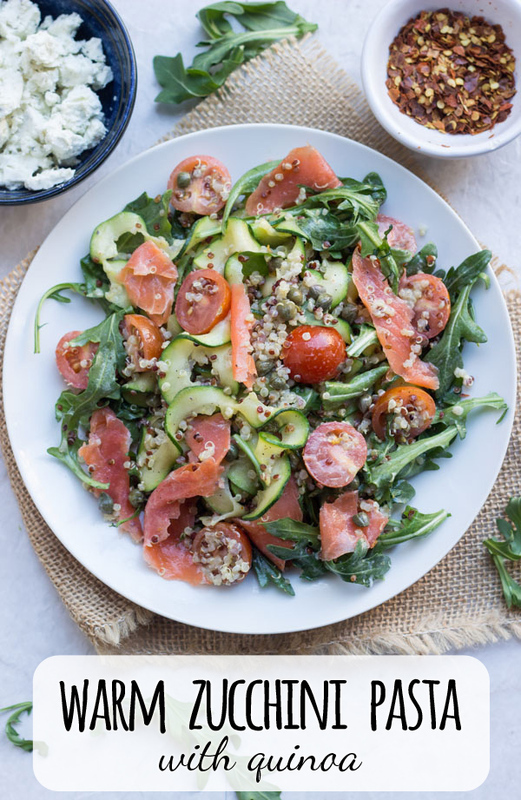 Equally split arugula, tomatoes, salmon, quinoa and capers onto each dish. Add cashew dressing to each bowl and toss until ingredients are coated. Continue adding dressing until desired consistency is achieved. Alyssa is the quinoa-obsessed girl behind the gluten-free website Queen of Quinoa. She enjoys sharing nutritious, wholesome recipes all with a little quinoa twist. She is also the author of two ebooks, Baking with Quinoa and A Quinoa Thanksgiving.